This colder weather is great timing for letter writing and checking out the Knitting Watercolour Postcard Set Kelly Connor Designs offers at her Etsy Shop. It is time to get out the hot chocolate, hot tea, or perhaps even coffee! 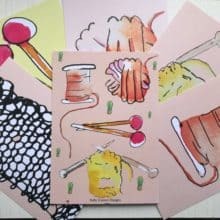 The complete Knitting Watercolour Postcard set of six is less than ten dollars, and with shipping from the United Kingdom looking at a total of fourteen dollars. 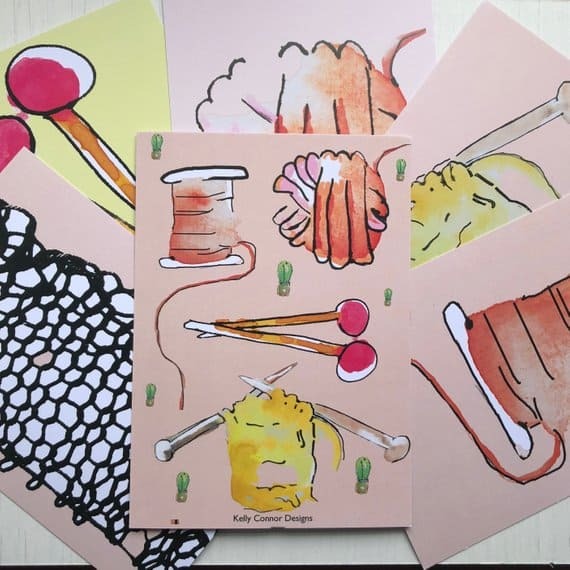 “These knitting postcards are so cute and perfect for popping in with a knitting gift or why not put them in some A6 frames and decorate your knitting space? In addition, these are beautiful Watercolour postcards I’m seriously considering ordering. Lastly, I’ve got some Pen Pals who knit and it would be fun writing on them. In conclusion, as we “wrap up” today’s post, I’m happy seeing all of my winter sweaters are out of their offseason storage bags and easy to reach and wear. While some dog owners get a dog coat for their dogs, our family dog Cooper, a Brittany Spaniel LOVES this cold weather. He is after all a bird dog! P.S. Although it is January, don’t forget your sunscreen! I’m using an spf30 these days, especially on my face before putting on the moisturizers, etc. And I’m excited about using the custom hand lotion from a local pen pal. She is promising to send the ‘recipe’ to me on an index card. Stay tuned!